If you’ve ever wondered what happens after you decide to use our digital signage software, then this article will clarify the matter to you. We’ve asked Sarah Roberts, Marketing Manager at AuDeo Systems– an experienced visual communications company based in Basingstoke, UK- to present the steps involved by the setup of a digital signage system. It is thanks to partners like AuDeo that we can be rest assured that our users are offered the best customer service and hardware solutions for their needs. So here’s what happens after the testing stage of our digital signage software. Our first step is to clarify the purpose & ways you wish to use Digital Signage. Our initial questions will be ones of ‘who and what’. Who is your audience going to be? What information do you want to share with them? Then follow the more detailed questions of budget, number of screens and locations, type of content/data you plan to use, who will manage the content, how often will content be updated, etc. The most critical part of any digital signage solution is the content but do you have the necessary design skills in-house to create eye-catching presentations? If not, we’ve got you covered. We love the creative element of digital signage and have a wealth of design and content ideas to offer you from creating bespoke content, videos, colour schemes and templates that match your corporate identity. Are you too busy to manage your screens? As experts in digitalsignage.NET and POV, we can help you schedule and publish content to bring your screens to life. AuDeo’s experienced digital signage team will work with you to design and manage creative content, covering as much or as little as you need. As our friends at Dynamax like to put it, the digital signage software is the glue that brings everything else together: content, players and displays. The difference between the different software types they offer is the amount of control you have over your system and how easy it is to use and manage. POV and digitalsignage.NET are great products that complement each other. They support a wide variety of content sources and allow us to offer single screen applications, networked equipment with multiple screens or fully managed digital signage systems. Great content needs to be delivered with creative impact. AuDeo has its core expertise in Visual Communications. A/V, Presentation, and Video Conferencing experience has allowed us to view Digital Signage not as an engineering challenge but a communications medium. So when it comes to choosing the hardware, we offer you the latest technology and clever detail that suits your projects’ needs. From our perspective, this is the most exciting stage of the project as we see the project taking shape. We get all the hassle out of the way by managing this critical stage for you. We configure your players and put the screens on the wall, we ensure there is an Internet connection in place and test the system before ‘’handing you the keys’’ (unless you want a managed solution). Our experienced engineers and project team will build your solution at your convenience and within guidelines. Whether it is the installation of a simple system or a large networked solution, the same care and attention to detail is taken to ensure you get the best service with the minimum of disruption. Dynamax and AuDeo work closely together to ensure that you get the best possible start for your project, great products that suit your needs and all the help you require in the process. So start by setting up a digitalsignage.NET account and when you’re ready to proceed with the installation stage, AuDeo is ready to help you. 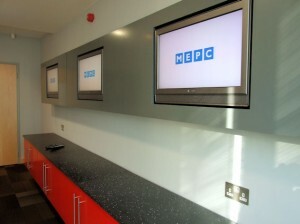 Here’s one of the projects we’ve worked on together for commercial property owner- MEPC. Sarah Roberts is Marketing Manager at AuDeo Systems Ltd. She has worked for AuDeo in the Visual Communications industry for 7 years, actively selling and promoting Digital Signage solutions for the last 4 years. Listen to Sarah talk about our companies’ partnership in this video. This entry was posted in Digital Signage, Hardware, Software and tagged AV technologies by Dynamax. Bookmark the permalink.